FG agrees with IMF on fuel subsidy - The Liberty Times™ Nigeria | @TLTNEWS247 Where the world listens to the Nigerian voice! Former Senate leader, Senator Ali Ndume on Monday vowed not to drop his ambition of becoming the Senate President of the ninth Senate. Senator Ndume met behind closed doors with Vice President Yemi Osinbajo at the Presidential Villa, Abuja. The meeting started around 3.20pm when Ndume arrived the Vice President’s office. Ndume is one of the frontline aspirants for the position of Senate President for the 9th Senate in June. He had declared his intention to run for the number three highest political office in the land despite the endorsement of the current Senate Leader, Ahmed Lawan by the ruling All Progressives Congress for the same position. Though his stiff opposition to some policies of the Senate President, Dr. Bukola Saraki appears to be the obstacle he may face in achieving his dreams. After the closed meeting, Senator Ndume declined to talk to State House correspondents that waited to know the agenda and outcome of the meeting with the Vice President. He said that he was still consulting and should not make any comments on the meeting. Also reminded that he was said to be opposition bride, he also replied, “Me that is regarded as enemy by opposition? Senator Ndume was suspended as a Senate leader because of his opposition to the non confirmation of the acting Chairman of the Economic and Financial Crimes Commission, EFCC and his loyalty to President Muhammadu Buhari. He was the Director of APC Presidential Campaign for the North East. 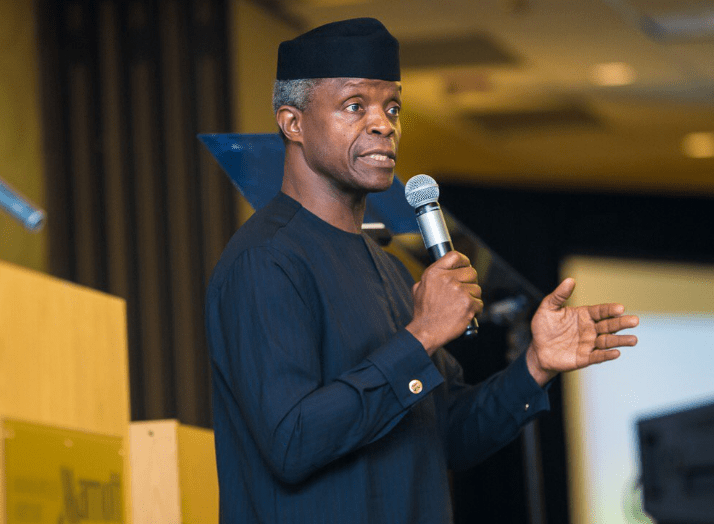 He delivered UNILAG’s convocation lecture with the theme, “Nigeria Rising: The Path to Prosperity.” Osinbajo said inflation in Nigeria had stabilised at 11 per cent over the past six months. He said, “We restored medium-term planning with the Economic Recovery and Growth Plan which served as a useful loadstone in improving macroeconomic performance, boosting the real sector of the economy and building infrastructure. “The decline in growth, which started at the end of 2014, has been reversed, inflation has stabilised at about 11 per cent over the past six months and our current account was in surplus around 1.3 per cent of the Gross Domestic Product last year.